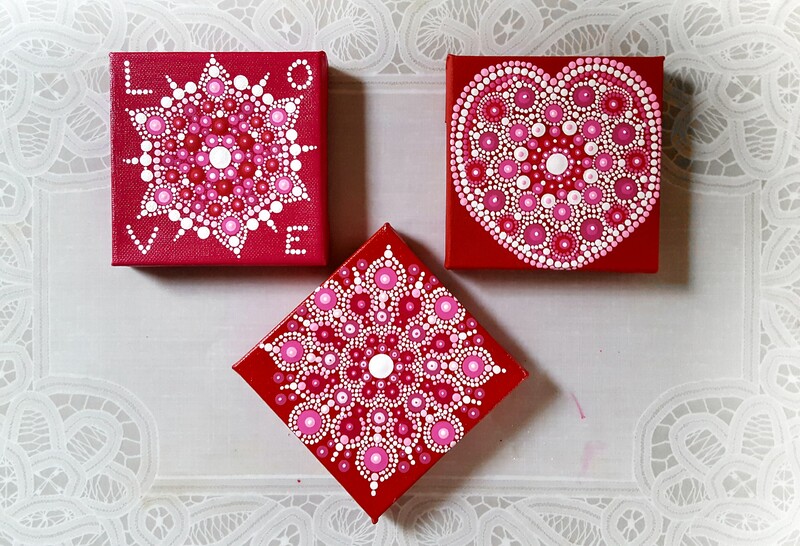 This entry was posted in Art, Mandalas and tagged Art, Love, Mandala, Mandalas, Valentine, Valentine's Day. Bookmark the permalink. I’ve lived here all my life, so I’ve definitely adapted to the climate. Snowstorms are beautiful to me too. 🙂 Sorry, but I actually haven’t taken any outdoor photos to share lately – it’s either been too cold, too icy (we had freezing rain in the mix so it’s made even walking outside a bit treacherous), or I’ve been too busy shoveling – I guess I’ve been more on survival-mode than anything else whenever I’ve been outside. I have taken lots of mind photos though. 😉 Valentiney, you know… like Valentine-themed? No photos might be a deal breaker. 🙂 But staying warm and safe sounds smart. Julie–these are beautiful! These are paints? They look like jewelry…pearls and different stones…gorgeous. I think they’re super!! Love them 💓 Hope you are well…stay warm😁 I can’t begin to think of living in those temperatures…brrrrrrrr! Okay, those are darling. I love them and I can’t get over your ability to do such intricate work!